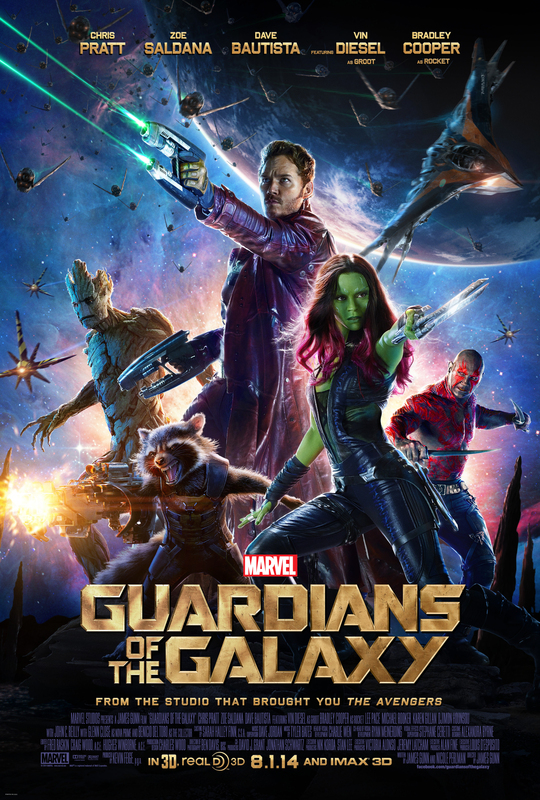 After his mother dies when he is a child, Peter Quill (Chris Pratt) is taken by a spaceship. The only thing he has to remind him of his mother is a Walk-Man with an “Awesome Mix” tape she had made him. And a present from her he had not yet opened. Twenty six years later, Peter, or “Star Lord,” as he would like to be known, is a Ravager. He travels through space with his partner, Yondu Udonta (Michael Rooker), stealing anything he can find of value to sell. On one such adventure, Peter takes a mysterious sphere, planning to sell it to an unknown buyer. As he tries to leave with the sphere, he meets with henchmen who work for Ronan (Lee Pace), who will stop at nothing to get the sphere for their commander. Ronan is considered a terrorist by those on Xandar. He follows the teachings of his ancient Kree civilization, vowing revenge on Xandar for crimes they committed against his people. Ronan has agreed to give the sphere to Thanos (Josh Brolin), who has been searching for the orb. In return, Thanos will destroy Xandar. Rocket (Bradley Cooper), a raccoon, and Groot (Vin Diesel), his tree friend with a very limited vocabulary, are bounty hunters. When Yondu places a bounty on Peter for double-crossing him, Rocket and Groot are determined to turn him in for the bounty. Luckily, Peter’s attempt to sell the sphere take him where Rocket and Groot are. Peter is confronted by Gamora (Zoe Saldana), a daughter of Thanos, who is working with Ronan to retrieve the sphere. After a skirmish, all 4 are arrested and sent to prison. After a brilliant escape from the prison, Rocket, Groot, Peter, and Gamora are joined by an unexpected ally, Drax (Dave Bautista), who has sworn vengeance on Ronan for killing his family. They head for Ronan, who has stolen the sphere. They have to find some way to stop him before he can destroy Xandar. Guardians of the Galaxy is definitely the blockbuster movie of the year. It is a cross between Star Wars and The Avengers. You have a misfit group of superheroes, only this time without super powers, traveling through space, fighting the dark forces in the universe. Peter Quill is Han Solo/Tony Stark. Groot is the Hulk/Chewbacca. Gamora is Princess Leia/Black Widow. Rocket and Drax, well, they’re thrown in to round out the mix. Where Star Wars and The Avengers through in handfuls of one-liners for some comedic relief, they are primarily sci-fi/action movies. Guardians takes the action in both of these movies and loads it up with plenty of comedy. If the characters are not involved in some sort of battle with an enemy, they are firing biting, sarcastic, hilarious quips. Sometimes, they do both at the same time. Writers James Gunn and Nicole Perlman found the right mix to keep the tone light enough, without the movie becoming a joke in itself. Credit also has to be given to the cast. Chris Pratt and Zoe Saldana are perfect in their roles. Pratt has the comedic timing to pull of the myriad of jokes, yet commanding enough to lead the team into battle. Zoe Saldana is completely believable as the highly skilled assassin. Women will likely be disappointed Bradley Cooper doesn’t make an actual appearance in the film, though I think Rocket does take his shirt off at one point. That’s close enough, I guess. Even without any real screen time, Bradley’s Rocket is full of his Cooper charm. His delivery is no less than what you get from him in his roles in The A-Team or American Hustle. Dave Bautista’s Drax is the straight man of the group. He takes everything literally. Literally. This plays up the differences in culture between the characters, especially Peter. The movie is heavy on the CGI. It has to be. It’s about a group of warriors battling demigods in space. It never falls into the trap of looking cheesy or overdone. Even if one of the main characters is a talking raccoon or a tree. There is plenty of action, be it space chases, prison riots, gunfights, or good old-fashioned fistfights. Yet, it never feels busy or crowded. Between the jokes and the action, the pace of the movie moves along nicely. You won’t find yourself bored or rushed. If you’re not a fan of graphic novel movies, there’s a good chance you won’t like Guardians. This one is a little heavier on the sci-fi angle than what we’ve seen from Marvel the past several years – aside from maybe Thor, so don’t expect a ripoff of The Avengers. Marvel, the experts on the genre, know how to get those who have never read, or even heard of Guardians up to speed on the story without bogging things down. I’m sure the movie may not be 100% faithful to the source material, but that shouldn’t detract anyone. The screening I attended did not include the end credits scene that are now ubiquitous on Marvel’s movies, but, from what I hear, it hints at the next chapter in the saga and some possible cameos. (No surprise.) They have set themselves up to do a crossover with The Avengers with some characters appearing in both films. While I would be anxious to see this, I am a bit nervous that it may be too much for one film to contain.